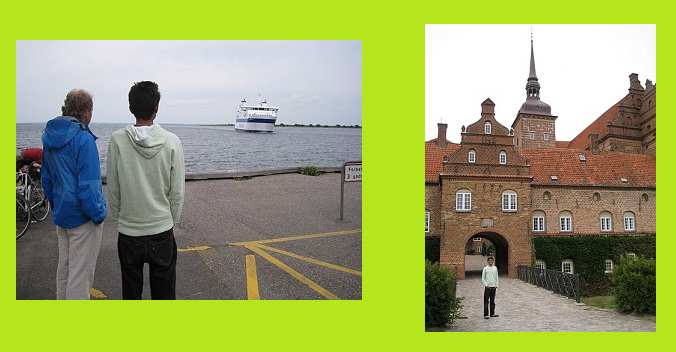 Jawad Ashraf, the Crown Green Angel (the Top National Winner), from Beaconhouse School System Gujrat (Pakistan) successfully completed his winning Study Trip to Denmark and found it to be a very productive and learning experience of his life. Denmark is the Role Model for Peace and Environmental Conservation, one of the top most countries in the world having best ranking for Peace and Environment Protection. Denmark is politically stable and enjoys good relations with its neighbours. Rates of violent crime and homicides are low, violent demonstrations are highly unlikely to occur and there is high level of respect for human rights. Although Denmark abandoned its policy of neutrality in 1949 to become a member of NATO, it has maintained a relatively modest level of defence contribution and refuses to allow nuclear weapons on its soil in peacetime. The most fascinating is Danish unique experience of Environment protection over the years. It is the world leader in the production of renewable energy. The impact of recycling is amazing with its zero waste strategies. The production of organic and biodynamic vegetables and fruits and remarkable water treatment and management systems are among the other promising areas of Environment Production. The productive outcome of the trip helped GLA in extending the benefits to hundreds of thousands more Green Angels and their families across Pakistan. Thanks to the innovative and productive ways used by the Danish governments and citizens to protect Environment a good number of people in Pakistan have adopted Environment Friendly lifestyles. Here are given few highlights of his trip. The Summer Camp was organized for the students from different nationalities and background to learn and work together in order to broaden the vision on the subjects like diversity, peace and environment protection. The activities were organized in such a way that each participant could feel comfortable at camp. Tvind International School Center is located 4 km outside Ulfborg, there is a small railway town between Ringkøbing and Holstebro. Tvind can accommodate people of many kinds, in a spacious and international development environment. Here is a series of cultural and other activities, large and small. The environment is international and characterized by good cooperation between schools. Working together, doing the tasks in groups, having fun, playing the games and learning the newer concepts on Peace and Environment Protection were the main aspects of the summer camp. The First Giant Windmill The landmark of Tvind is the giant windmill built in 1973, started by 200 young people without any prior experience of conducting such a big project. The mill took three years to build. For many years it remained the biggest mill in the world which is still in function and provides energy to the school facilities. A Study Visit to the Nordic Folkecenter The Nordic Folkecenter for Renewable Energy is one of the renowned organizations in the world to provide research, development of technology, training and information for the manufacture, industrial innovation and implementation of renewable energy technologies and energy savings in Denmark and throughout the world. Folkecenter intends to achieve measurable increases in the utilization of renewable energy technologies and thereby significant reductions in environmental pollution associated with energy use in Denmark and elsewhere. It has the cooperating network of the local authorities, national and international agencies, and the industry. The ultimate long term objective of the Folkecenter is a complete replacement of fossil fuels and atomic power with renewable energies. The Crown Green Angel got opportunity of knowing the ways how the centre operates for the promotion of the renewable energies in the world. The waste water treatment plant is used for the cleansing of water and the use of the waste products for energy production. Thisted waste water treatment plant continues their purification experiment and sees great potential in the production of Biogas from the waste water. Biogas typically refers to a gas produced by the biological breakdown of organic matter in the absence of oxygen. Biogas originates from biogenic material and is a type of bio-fuel. Biogas is produced by the anaerobic or fermentation of biodegradable materials such sewage and the municipal waste. Biogas comprises primarily methane and carbon dioxide and may have small amounts of hydrogen sulphide, moisture and siloxanes. Denmark has an old tradition for using wind to treat the agricultural produce, as well as windmill power production. In today’s Denmark the windmills are primarily used to produce power. Denmark is a World leading producer of windmills, led by the Vestas windmill manufacturer. A large windmill farm is located next to a coal powered power plant at Avedøre South of Copenhagen, and basically symbolizes the wish to produce the needed energy through "natural" means such as windmill power, rather than through burning coal and releasing carbon dioxide, CO2. When sailing to or from Copenhagen, and when landing at Copenhagen Airport, you may very well be greeted by the image of the sea windmill farm with 20 windmills just outside Copenhagen Harbor at the shallow area of Middelgrunden. Each windmill has a height of 64 meters and a rotor diameter of 76 meters. Each turbine has a capacity of 2Mw. The power generated is used to supply Copenhagen with environmentally friendly electricity. Biodynamic farming is one of the prominent features of Danish growing of vegetables and fruits which has been scientifically shown to produce more friable, fertile soils and healthier plants and animals. Under Biodynamics, soils develop much higher humus levels, (absorbing and holding considerable tonnages of carbon dioxide from the atmosphere), allow faster infiltration of water, hold much more water than conventional soils and require less frequent irrigation. In the preparation of the soil the cattle's manure is composted and spread as fertilizer. Biodynamics can progressively bring salt-affected land back into full production. Biodynamics involves the use of a wide range of techniques including the all-important Biodynamic preparations, a series of biological materials that powerfully develop soil microbial activity, root growth, humus formation and light metabolism. Other techniques include Biodynamic composting, careful cultivation methods, and the use of a scientifically based moon and zodiac planting chart to enhance production. Barritskov (in Eastern Jutland) is the largest organic farm in Denmark. Main crops include vegetables, including cabbage, salads, fennel, celery leaves and culinary herbs. Barritskov, in partnership with three other farms (Ringstholm, Billeslund and Krogerup) together farm a total 900 ha of cropland. The total production of Barritskov and part of its partners’ is sold through a box scheme/Internet company AArstiderne, which means seasons. Although a small country, Denmark has become an important market for organic foodstuffs with a retail market value estimated at approximately DK3 000 million in 2000, corresponding to an estimated 2.5-3.0 percent of the total food market. This probably represents the highest organic market share in the world. As shown earlier, the market has grown very rapidly between 1993 and 1999, enjoying annual growth rates of between 25-50 percent, according to trade sources. Aeroe Island Aeroe in Denmark is of about 30 km in length, its width up to 8 km, ‘the Ship in a Bottle Island’ that is what it has been called. Aeroe is located in the Danish Baltic Sea. The landscape of Aeroe Island is dominated by hills, there are three small towns. The largest town is Marstal, second largest town Aeroeskoebing followed by Søby with a total of 14 villages. Aeroe is inhabited by a total of 7,050 people. There are several farms on the island and people are most friendly, trusting and honest. It is one of the few places in the world where you can leave your house unlocked, or, even leave your car keys in the ignition. The Aeroe Island is thereby the worth seeing place to see Peace and Environment existing together. The world's largest solar power plants at Aeroe Aeroe has the world's largest solar power plants, with an area of 18,365 m². It covers a third of Marstal's power consumption. Aeroe is endeavouring to make the island self-sufficient in energy, and in 2002 a figure of 40 % self-sufficiency in renewable energy was reached. In 2008, Aeroe Islands self sufficiency has reached over 80% in terms of electricity and heating. These initiatives have earned Ærø both international recognition and a number of prestigious awards, both domestic, such as the Solar Town 2000 award, and international, such as the Energy Globe 2001 and a European Union sustainable community award. Given that background, it is fitting that world’s largest solar collector system for heating is on Aeroe. The Crown Green Angel visited a Danish Waste Centre for reuse which is a grand project to automatically place the waste in big compartments including organics, cement, plastics, glass, furniture and almost everything. Generally the entire Denmark and especially the City of Copenhagen works to reduce the impacts on the environment, including climatic impact, through sustainable management of waste. Also, the waste management system is aimed at ensuring that citizens are satisfied with waste management services. The future vision is aimed at more waste prevention and reuse, prevention of 2.500 tons of waste, increase in separation of waste, 32.000 tons of waste for recycling instead of incineration, sustainable waste treatment system, innovative waste solutions in urban spaces and tender for collection and treatment of waste.